Skin infections, and particularly cold sores, are probably one of the most irritating and often painful conditions that any of us can have. Most often people are going to want to do whatever it takes to eliminate this nasty viral infection, as its unsightly appearance and bothersome presence can be very emotionally disturbing. Treating cold sores is often done through creams, prescriptions or medicines but there is one product that does not require the mess or inconvenience to using a topical herbal or prescription based medicine, this is the Virulite Cold Sore Machine. 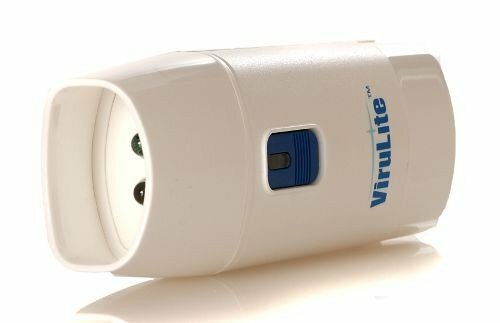 This product review will aim to inform you of whether or not the Virulite Cold Sore Machine is an appropriate investment for you, going into depth on how the product works and if it is truly effective as a cold sore removal device and as a great alternative to creams, ointments or medicines for cold sores. Whether it be its zero side effects or its usage of LED lights that are also invisible, we will look at the available feedback and data to analyze whether or not the product actually removes cold sores and especially, if it does so in a manner of comfort and efficiency. This review may be comprehensive in detail, we recommend you bookmark this page, especially if you don't time to currently read the review, so in the meantime, feel free to click the button below to view the full product details and current pricing on Amazon. Are There Any Problems With The Virulite Cold Sore Machine? This invisible light, that has been proven to be safe by the FDA, will stimulate one's immune system to respond more efficiently and faster to the infection, the cold sores, that occur on the body. The 1072 nanometer lights aim to diminish the cold sore pathogens, in which the naturally occurring light has been proven effective by the US National Center for Biotechnology Information. The 2 LED lights installed within the machine send out specific 1072 nanometer pulsed bursts onto the affected areas and will therefore induce an immune response, attacking the cold sore antigens and allowing it to dissipate faster. The Virulite Cold Sore Machine is relatively simple, it only contains LEDs, plastic and a battery which means it is a very safe product. Its purpose is to remove skin infections and with minimal ingredients, the product should not be able to cause side effects or cause allergic reactions whatsoever seeing as though there are no organic or live ingredients within the Virulite Cold Sore Machine. It would be untrue to say that because the product has no ingredients so it must be 100% safe but as of now, there are no reported issues or problems that have the potential to cause injury or damage to one's body. This product is not only effective but convenient and time-saving seeing as though the procedure is just 3 minutes long. All it requires is the user to turn on the machine and shine the LED light onto the affected area, for three minutes in which the in-built self-timer will alert the user when the three minutes is over, which is super convenient because it means users do not have to constantly check the time. The product requires only two procedures a day, with a 12 hour break, so realistically its just 6 minutes a day, compared to some creams or other products that must be applied then users must wait for it the product's properties to perform its job which may take much, much longer than the Virilute Cold Sore Machine's 3 minute process. The product prides itself on its convenience and time-saving, which is possibly one of the reasons consumers are willing to purchase the product. The Virulite Cold Sore Machine uses 3 LED lights, with the first two used in the actual treatment process itself, where users point the two red LED lights onto the affected area itself and third green LED light lets users know if the machine is working correctly and properly. The green LED light continues to blink during the process and ends once the process is over and the convenient aspect is that LED lights are invisible to the eye so there should not be any potential risk of eye injuries or problems (unless you directly shine the light into your or someone else's eyes which is most certainly not advisable). Whilst not necessarily a physical feature, the Virulite Cold Sore Machine prides itself on its safety because it is has been clinicially proven to work with zero side effects, as concluded by the US National Center for Biotechnology Information. Added to the fact its clinically proven by the US National Center, the product has also been approved by the FDA, with technology originally used by medical professionals so users should feel confidence in the safety and consistency of the product. Thus, since the product is so simple with no ingredients, it is much safer than ointments or creams which can have the potential to cause allergic reactions or intolerances, increasing the overall safety of the Virulite Cold Sore Machine. 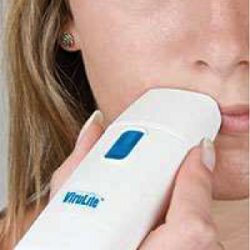 When writing the feedback for the Virulite Cold Sore Machine, we mainly extracted reviews from Amazon which at the time of writing, July 2018, there were a total of 191 reviews with an average score of 4.1/5 which suggests that the product does have some positives but there are flaws or areas of dissatisfaction that consumers generally did not agree with or appreciate. Of those 191 reviews, 65% voted the product an excellent 5/5, which is about 124 people, 12%, or 23 voted a solid 4/5, 6% or 11 people voted a decent 3/5, 4% or 8 people voted 2/5 and a 13%, or 25 people voted a 1/5. Now we will go into depth what aspects or features consumers appreciate or liked regarding the Virulite Cold Sore Machine and in contrast, why that 13% voted the product 1/5 and what future improvements could be made to increased the product's worth and value within the health products market. 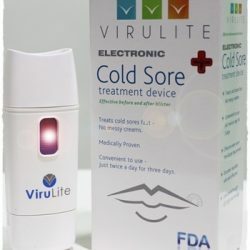 The majority of consumers who bought the Virulite Cold Sore Machine commented on the value of the product, claiming it was worth the investment as a relatively expensive health product and that many features also increased the product's worth and value such as its faster healing process, simplicity, ease and the fact that the device is a great alternative. Many reviewers appreciated the Virulite Cold Sore Machine, claiming it was ‘worth it' and that they recommended this product for those wishing to remove cold sores quickly, safely and efficiently. Another area of satisfaction was its status as an alternative to creams, ointments, medicines, prescriptions, drugs or OTC with the Virulite Cold Sore Machine being reusable and does not diminish in quantity after every application. Users also provided results and documented their journeys of the Virulite Cold Sore Machine where their cold sores were healed within days, sometimes halving or reducing the time for their infections to heal by a third in comparison to other cold sore treatments. Reviewers also liked the simplicity of the model in both usage and portability, proving that the Virulite Cold Sore Machine is a device is a safe and effective product that attempts to do perform its function as a cold sore remover. However, of the 191 reviews with 25 voting 1/5 and 8 voting 2/5, it can be seen that the product does have issues in which the main issue was that it did not work. Users were dissatisfied and disappointed that the Virulite Cold Sore Machine did not yield any real results and their cold sores did not actually displeasure. Reviewers also found the battery to be another issue where some users had faulty and broken batteries, which then rendered the product unusable. Other areas of negative feedback included that it should have come with a case so it could be easy to transport, have recharging capability and does not require manual insertion of batteries and that the instructions were explicit and conflicting where the instructions on the box contradicted the instructions online. In saying that, it seems that the biggest issue was that the Virulite Cold Sore Machines may have been faulty and not necessarily because it does not work on every person, certain properties of the machine were possibly damaged or incorrectly manufactured during production or transportation. So, the Virulite Cold Sore Machine is not necessarily a bad product, there are just some areas that need to be improved so users are given a working and proper device, which could be fortunately fixed with the return policy from Virulite. Are There Any Problems WithThe Virulite Cold Sore Machine? With quite a fair amount of negative reviews, with 17% on Amazon finding the product unsatisfactory or not to their likings, the problems of the Virulite Cold Sore Machine must be discussed in the hopes it can be improved in the near future. In regards to the medical aspect of the device, there are no problems or associated side effects so that factor can be approved but it is more so the mechanical aspect of the device itself, particularly the recharging capability of the Virulite Cold Sore Machine where users would much prefer to be able to charge the device and not need to manually take out the battery and replace it with a new battery. Again, the main problem of the device is that it may not work for all consumers, not because it doesn't cater for every individual, but more so that something in the machine has been manufactured incorrectly and so subsequently, whether it is the LED light or the 1072nm wavelengths or the timer has been constructed wrongly, the Virulite Cold Sore Machine will not work and users will rate the product accordingly. For the Virulite Cold Sore Machine to truly be a machine that will convince users to purchase this relatively expensive product as an alternative to creams or medicinal prescriptions, the device must be manufactured correctly and that maybe a recharging function could be added to further improve convenience and effectiveness. As with any online product, choosing a retailer that will provide a relatively quick, safe and easy customer purchasing experience will be difficult seeing as though there are a variety of retailers out there such as Alibaba or Ebay. There are particular factors you would want to be fulfilled when purchasing a relatively expensive as well as valuable product such as the Virulite Cold Sore Machine such as convenience, time, customer service or security. In our opinion, we recommend Amazon purely because it has the one of the tightest online protection and security, if not the strongest in the world. What kind of light does the device emit? 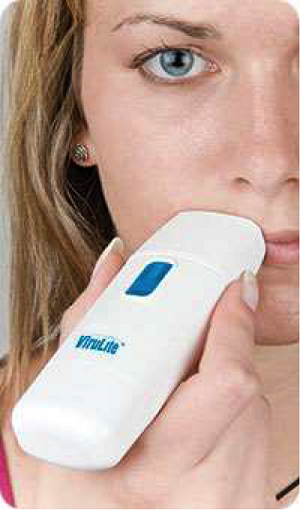 The Virulite Cold Sore Machine emits an invisible LED light that is 1072 nanometers. Yes, the device does come with a replaceable battery. No, the device is about the same size of a deodorant stick and can be held with just one hand. Yes, the Virulite Cold Sore Machine is portable and small, so it should be easy to carry and can be stored in a bag, purse or anything. How do I know the machine is working? The Virulite Cold Sore Machine has 3 LED lights and the third LED light is a green light that blinks during the treatment process and will tell you if the machine is working if it is blinking. When is the best time to use the device? 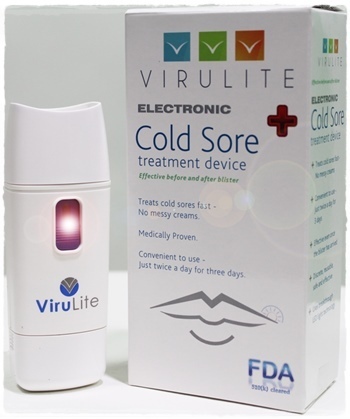 The Virulite Cold Sore Machine should be used if symptoms of cold sores begin to appear and has been clinically proven to fasten the healing process of cold sores. Can I use it inside my mouth? No, the instructions recommend external use only. Does the device cause pain? No, the Virulite Cold Sore Machine does not cause any pain, allergic reactions or injuries to the user. What is the science behind this device? The Virulite Cold Sore Machine uses invisible infrared lights that stimulates an immune response in the affected area, essentially speeding up the recovery where the 1072nm LED lights have been clinically proven to increase the healing process. What is the voltage of the batteries? The Virulite Cold Sore Machine requires batteries with 9V voltage. The treatment process is 3 minutes long and is recommended to be done twice within a day, with a 12 hour interval in between to allow the cold sore to recede naturally, so realistically 6 minutes in one day. Does the machine ever die or break? 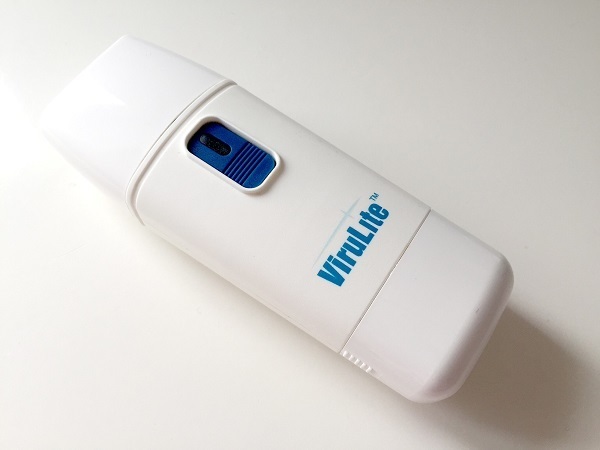 According to Virulite, the device can handle 500 uses. Are the batteries replaceable or do I have to get a whole new device? The Virulite Cold Sore Machine has replaceable batteries in the bottom, there is no need to purchase a whole new device, as long as the battery is 9V. How can I see this invisible light? The invisible light is invisible to the naked eye, but can be seen through a phone's camera or lens. Can I use it more than twice in one day? It is not proven that more applications will hasten the healing process, so it is not recommended you use the Virulite Cold Sore Machine twice in one day. Conclusion – Is The Virulite Cold Sore Machine Worth Buying? 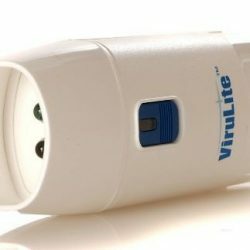 Hopefully, you've had the time to read the product review in its fullest, and if not, we will now quickly summarize, judging whether or not the Virulite Cold Sore Machine is actually worth its price. The device has gathered up quite the reputation, not necessarily as a product of effectiveness and efficiency but users have reported hastened healing times, its simplicity, portability and its position as an alternative to cols ore treatments, but again, we must remind you that is your choice completely if you want to purchase the product, with this review allowing you to make an informed decision. With an invisible 1072nm light, that once shined upon the affected area will diminish cold sore growth, no reported side effects by the US National Center for Biotechnology Information and the fact that it has no ingredients, means users will experience safe, effective and convenient treatment processes in eliminating cold sores. 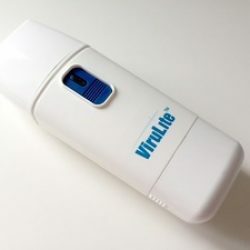 Despite its inconvenient battery replacements, its explicit instructions and the major issue of the Virulite Cold Sore Machine not actually working or performing its function, the product is still a worthwhile investment, provided you receive a proper, functioning and correctly manufactured product, which if you do not, could always be returned with Virulite's return policy.